Raising chickens, turkeys, ducks and other breeds of poultry is becoming increasingly popular in suburban and rural areas of the United States...even in urban areas where allowed! It can be a great idea to keep backyard chickens, where the birds can free-range around your grounds or enjoy a spacious coop, while providing eggs daily, fresh meat when desired or simply companionship and joy to their owners. Raising backyard birds can also be a great way to teach children about the responsibilities of animal husbandry and the importance of farming in feeding our families around the world. The items selected for this gift guide include informative reference books on raising chickens and other bird varieties, useful items for the poultry farmer, and also fun novelties to express a person's pride in being a "backyard chicken" lover. So surprise someone this Christmas - or any gift-giving holiday - with something unique and that shows you know he loves his birds. What Do I Know About Backyard Chickens and Poultry? Plenty! Why I Know These Would Make Great Gifts for a Backyard Chicken Enthusiast. 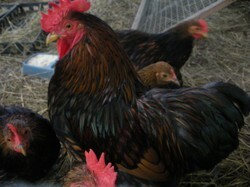 My mother began raising chickens after "rescuing" some bedraggled-looking birds from a farm auction several years ago. This has turned into a true passion and wonderful endeavor for her, as she has discovered the joy - and fun personalities - of the different varieties of birds she now has in her backyard. From egg-laying and dependable hybrid hens to her watchful Leghorn rooster, to her beautiful ornamental Cochin chickens and heritage breed White Holland turkeys, poultry farming has become a great love and one that brings terrific rewards as well. Not only is there nothing like a freshly-laid egg from a free-ranging bird, they help keep the grounds free of nasty insects such as deer ticks and fertilize the soil. Some heritage variety species of poultry are endangered and rare today, so helping to keep these breeds alive is a rewarding endeavor as well. I've spent many hours helping feed and tend to these birds, some from young hatchlings to now full-size adults. I know much of what it takes to keep "backyard" and small-farm chickens healthy and happy, and what are some of the great accessories, books and other items which can make raising poultry that much easier. Check out their wide variety of t-shirts, mugs, prints, and more all in tribute to backyard birds! Items for your favorite fowl to keep them happy, healthy and safe. Hen Saver Hen Apron - A Must-Have for Happy Hens! A Gift That Hens and Hen-Keepers Will Both Appreciate! If there's one gift I bought for my mom's flock that she (and her hens) are grateful for, its a bunch of these Hen Saver Aprons. Available in various sizes, for full size and bantam hens, and in several different colors, they are terrific protection for hens' backfeathers and wings. If your poultry enthusiast has roosters along with her hens, then she's probably seen how some hens can get picked on and loose feathers on their backs, or even suffer angry wounds from over-enthusiastic roosters. I've seen such hens take very well to wearing these aprons, and sure enough within weeks their feathers were coming back and they were much happier and healthier! Wounds and featherloss caused by roosters mating with their hens can lead to infection, picking, cannibalism and even death if not guarded against and carefully watched! That's why hen aprons can be so vital to protect hens until fully healed - or to keep them covered as a preventive measure on a regular basis. These well-constructed aprons hold up nicely and are available in different sizes and colors. Either dress up your hen in fanciful colors or get one to match the color of their feathers. Here you can see another style of hen apron, available in a variety of fun colors and patterns! These are produced by a different manufacturer. A set of five is a great idea for someone who has a number of hens - and maybe wants to keep track of them easier with the different color aprons. Books on Raising Backyard Chickens - Guides for Getting Started...And Beyond! Know someone who is just getting started raising chickens? Then one of these books would make a perfect gift. Each provides lots of info from picking the right breed to diet and health necessities. There are even guides for building a unique and special coop instead of buying a pre-made one! Yes, of course the "Dummies" series of books has a title on raising chickens! All of your basic questions are answered here, from choosing the right birds to managing laying hens, raising chickens for meat, and of course dietary and housing basics. While there are plenty of pre-made coops available, some people may eventually wish to design their very own coops to suit the needs and size of their flock. This book covers everything you need to know to build a proper chicken coop from carpentry skills and equipment needed to schematic diagrams of five different designs. Not so much a technical guide as a spiritual one to the joys and benefits of chicken raising. It might even be a good gift idea for family members of someone who raises backyard chickens and might be puzzled as to why they chose this particular hobby. Meet the Chicken Whisperer Himself! Clearly written in easy-to-follow language, this book is highly recommended for the practical information it provides to beginning chicken farmers. Turkeys, Bantam Chickens, Ducks and More! Does your poultry lover raise other birds, such as guinea hens or turkeys? Then one of these books is sure to be a useful resource of information and tips for successful poultry farming. What's it like having turkeys in your backyard? Bantams are a small breed of chicken, many with beautifully colored feathers making them a delight to have in your backyard. Learn all about different breeds of Bantams as well as chicken behavior that's helpful to know when dealing with your birds. Storey's Guides are always highly recommended by poultry farmers, and their book on ducks is no exception. If you know someone who is considering introducing ducks to their flock or needs more information on the subject, this is a great book to start them off with. Colorful, unique guinea fowl are a favorite among many who love game birds. Learn more about their personalities and how to care for them in this book. Here's a fun toy that will keep your birds happy and entertained! Fill the ball with cabbage, lettuce or other greens and let them play and peck. 100% natural whole-dried mealworms. These treats are especially welcome by chickens in the wintertime when they can't go out and forage for their own worms and insects to snack on. Protect backyard chickens and other birds from predators. A flash of light when detected will scare off raccoons, foxes, rodents and others that might try to sneak up on your flock at night. Decorative art and poster prints featuring poultry-related designs. Framed or mounted for hanging, these would made nice gifts for any enthusiast. I hope this gift guide gave you some ideas for that special "chicken farmer" in your life! Good article, helpful for anyone into self-reliance. I've been raising chickens, ducks and guineas for many years, so I know that many of the items listed in your article make great gifts! My chickens love the Happy Hen Treats Mealworms -- especially in the winter when bugs are in hibernation. For those who are just starting out, the "Storey" guide books have all the information you need.